There are many circumstances in which you would wish to deactivate ZBrush. The most obvious is if you are going to be moving it to a computer, in which case you need to deactivate the old copy so that the activation is now available for use on the new machine. Another case would be if you are preparing to reinstall your computer’s operating system or make a major OS up­grade – both things that cause your computer’s “digital thumbprint” to change, making ZBrush believe that it is on a new machine. Before doing any of these things, please deactivate ZBrush. Ideally, this should be done before removing ZBrush from your computer. Before uninstalling ZBrush or reinstalling your operating system you should deactivate the application. If you do not do so, it will continue to count against your serial number, potentially preventing activation later. 2. Select the ZBrush license from the activated software list (1) and then click the Deactivate button (2). 3. Click OK when prompted. ZBrush will immediately be disabled and after a few moments you will receive a message from the server notifying you that the deactivation was successful. The window will then close. If your computer does not have internet access, a deactivation Request File will be created (similar to offline activation). Save this file to your computer and take it to any machine that does have internet access. There, go to https://register.pixologic.com/deactivate. That web page will ask for your deactivation file and complete the deactivation for you. 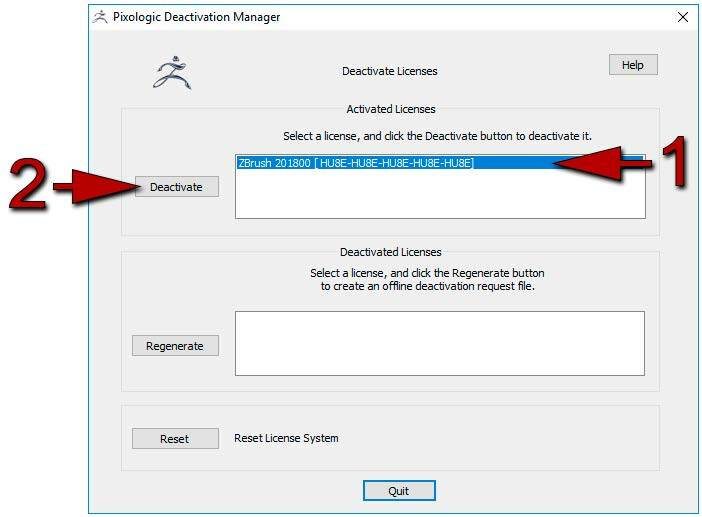 Use this option if your computer has suffered a hardware failure or other issue that prevents you from accessing the Pixologic Deactivation Manager. For any computer that is online, this system can be used to remotely deactivate that copy of ZBrush and return its activation to the license pool. The next time that copy of ZBrush is run, it will automatically detect its change in activation status and disable itself. This is very conve­nient for situations such as if you’re on a trip and you suddenly need to install ZBrush on a computer, or for IT managers that need to re-image their systems on a regular basis. However, it should NEVER be used as a method of cheating the system to get more activations than your license allows. You will first need to log into the My Licenses page on the Pixologic website, using your Pixologic ID. There, you can select your preferred language by clicking the Language dropdown. My Licenses will list all serial numbers associated with your Pixologic ID. You can view the activations currently in use for each serial number by clicking the “View Active Device(s)” link (1). 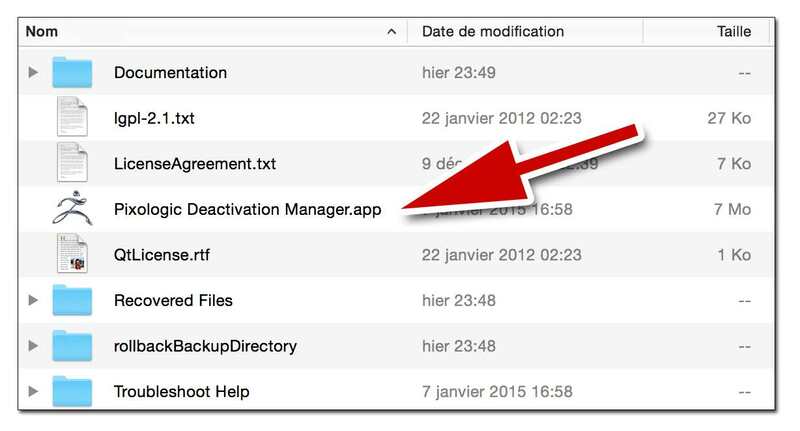 Next to the license that you wish to deactivate, click the Request Deactivation button (2). The web page will now display your license’s activation history. Currently active copies of ZBrush will be shown in green. Select the particular activation that you wish to shut down by clicking the appropriate check box under the “Remove” column (1). You will also be asked for a reason for this deactivation (2). Just tell us why you are using the My Licenses page instead of the Pixologic Deactivation Manager. After you have selected the activation for removal and entered the reason, click the “Request Deactivation” button (3). The next page will display a summary of the deactivation with the information from the previous step. If everything is valid, please click on the “Confirm Deactivation Request” button. After a few seconds, the server should inform you that the deactivation has been completed. You can now either return to My Licenses or Logout.